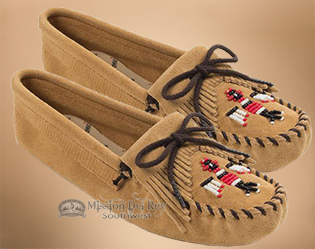 This fabulous beaded moccasin made for classic Native style and comfort is handcrafted with soft suede leather. With use the soft sole suede will form to your foot with every step for a cozy feel. These thunderbird beaded moccasins have a fully padded insole to keep things comfy.